Before booking your flight, visit your vet to ensure your animal is good to go. A majority of airlines require clearance signed by your veterinarian saying your pet is healthy enough to travel. Before booking your ticket, contact the airline directly to make sure it (a) allows pets on board and (b) allows pets for your specific dates. Airlines have regulations about how many pets can travel on one flight. It must be noted that airlines also have rules about how long a flight can be when an animal is on board — most flights under 12 hours are allowed. There are a couple of options when it comes to bringing your pet on a plane – checking them as cargo or bring them in-cabin and placing them under the seat in front of you. There is a third option if your pet is a designated emotional support animal, but several airlines are cracking down on what qualifies as that. You should always opt for in-cabin transport, if possible. “Excessively hot or cold temperatures, poor ventilation, and rough handling are often to blame” for animals deaths on commercial planes, the Humane Society reports. However, if your animal is above a certain height or weight – each airline has its own regulations – they may not be allowed to travel in-cabin and must be checked in the cargo hold. 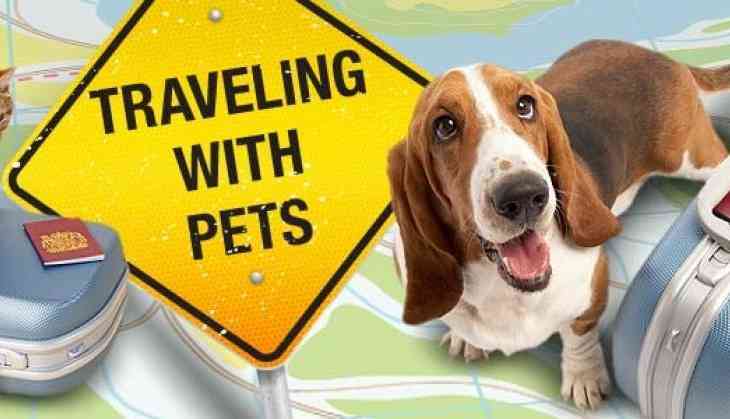 If traveling with a dog, know if they are a breed that can travel safely. “Air travel can be particularly dangerous for animals with ‘pushed-in’ faces (the medical term is ‘brachycephalic’) such as bulldogs, pugs and Persian cats. Their short nasal passages leave them especially vulnerable to oxygen deprivation and heat stroke,” Humane Society reports. Under no circumstances should brachycephalic animals be shipped in the cargo hold. According to the Humane Society, the cargo hold of airplanes can be dangerous to animals. “Excessively hot or cold temperatures, poor ventilation, and rough handling are often to blame” for animals deaths on commercial planes, the Humane Society reports. However, if your animal is above a certain height or weight – each airline has its own regulations – they may not be allowed to travel in-cabin and must be checked in the cargo hold. Airlines have limits for the number of animals that can fly each day, so check ahead that there is room for you and your pal. To ensure the smoothest travel experience, experts recommend avoiding holidays and busy times like the weekends. Opt for a less-traveled day like Tuesday or Wednesday afternoon. After you purchase a ticket for you and a ticket for your pet, check the requirements for crates. Each airline has its own requirement for size and structure. 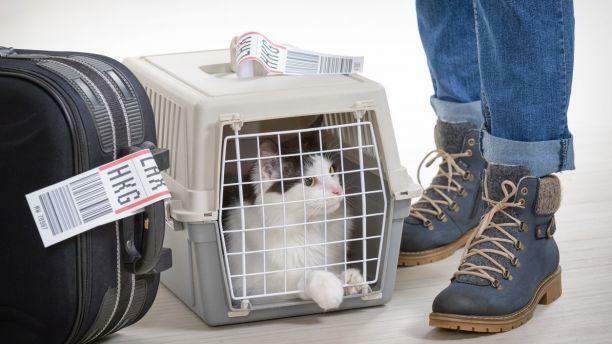 Soft-sided carriers that easily compress to sit under a seat is best for in-cabin travel.Cargo-bound pets need a hard plastic crate with working handles and doors. Most airlines require your pet to be able to stand up and turn around in the crate. While some animals may be nervous flyers, it is not recommended to administer medication to your pet before a flight in case of an adverse reaction. However, your veterinarian should have the final say and may prescribe a light sedative. Your pet must stay in its carrier for the duration of the flight for the safety of the other passengers, as well as itself. Keep your pet under the seat in front of you if traveling in-cabin. 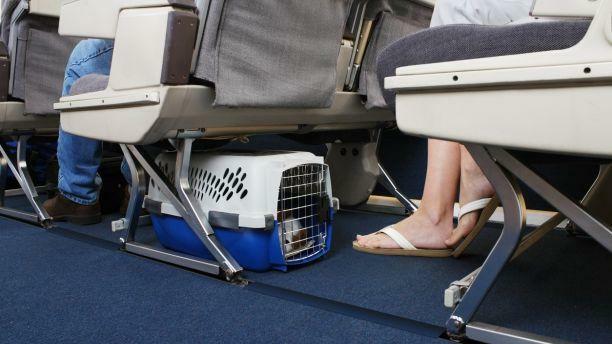 Your pet’s carry-on ticket entitles you to the space under the seat in front of you. Do not place your pet anywhere other than the authorized seat. Under no circumstances should you place your animal in the overhead bin or other areas of the plane. As soon as you arrive, get to a safe place in the airport and examine your pet. If anything seems wrong, take your pet to a veterinarian immediately. Get the results of the examination in writing, including the date and time.